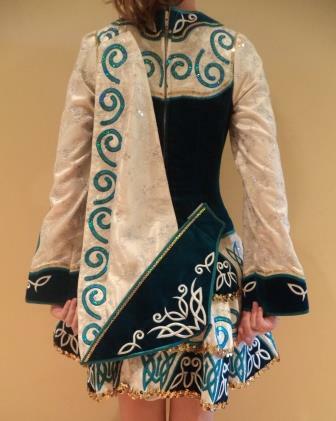 Made by Elevation Design, timeless dress style, turquoise velvet bodice, silver embroidered stitching with gold and silver embellishments, patterned with Swarovski crystals. Good condition, nice stage presence, always kept in smoke free environments. Gently owned by 2 prelim and open dancers, original crown included. 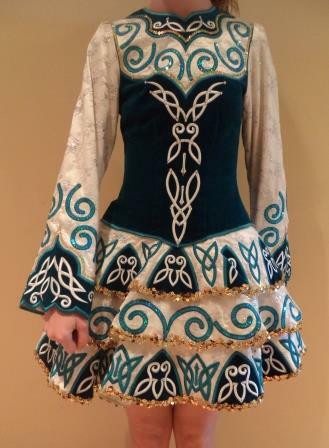 Worn at a World Championship and a Regional Oireachtas, suitable for most levels. Accessories: Crown/headband and white bloomers. 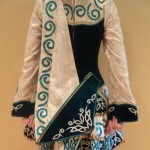 Full Length: 28.5 inches, from front center neck to hem. Skirt tiers may be altered to shorten dress. Asking Price: $US625. Shipping costs are not included in the asking price. Sale is final.